Did you know that Lake Tuusula which is located about 30 km from Helsinki city center once gathered together some of the most well-known Finnish artists, poets, authors, and composers? 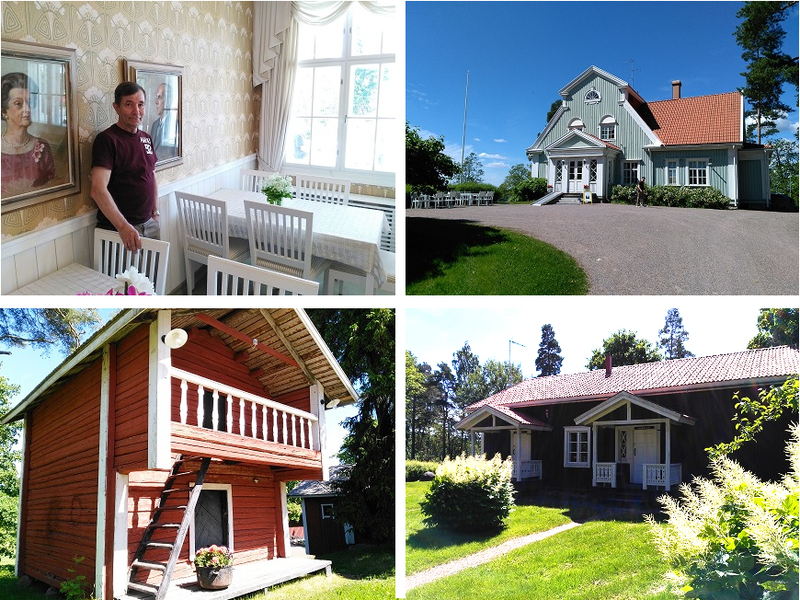 We in LikeFinland.fi team started exploring Lake Tuusula by visiting a new accommodation place called Pescator Villas. These unique, luxury rental villas are situated by a lake called Tuusulanjärvi (Lake Tuusula in English) – only 30 minutes from Helsinki city center. These apartments are architecturally incredible! We entered into a high ceiling room with massive windows and saw the beautiful clear view to the lake from one of the Villas. The decorative details are perfect for the different spaces in the house, and the view of the lake looks like a painting. We were warmly welcomed in by the Manager Krista Lahti (on left) of Pescator Villas and her colleague Krista-Mari Katajisto who both were excited about the possibilities these villas could offer for different kinds of customer groups. There are historical places to visit and sporty activities to do by Lake Tuusula. These apartments have everything you could possibly want and need while visiting and staying in Finland! There are beds for 11–13 people in each Villa. Each Villa has been named in Finnish after different fish species. Krista Lahti told us that people are usually stunned by the villas and the unique atmosphere they have. She mentioned one example where one customer even came and hugged her because she was so happy that they had found this amazing accommodation! On Booking.com this accommodation has received 9,6/10 points in customer reviews. These spacious apartments would be absolutely perfect for a friend or family gathering: the houses include modern luxuries such as a hot tub, saunas, washer, dryer, and TV with amazing sound and also a modern kitchen with all the appliances you can possibly need. We were told that customers can also use the catering services or order a basket full of delicacies from a nearby bakery if they don't want to cook by themselves! Even though you most likely would enjoy your time just by having fun inside these beautiful houses and by enjoying the view, you should also get to know the surrounding area. 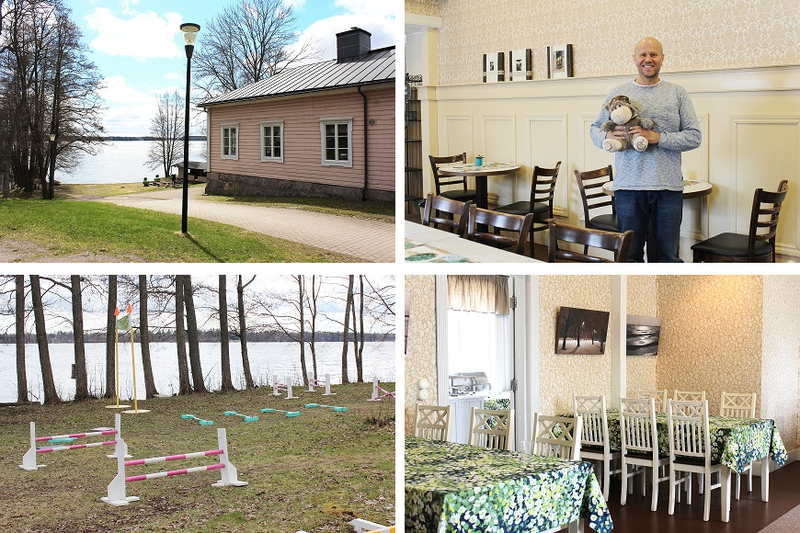 Lake Tuusula area is full of activities to do and historical sites to see! We did! Near Pescator Villas the charming Finnish nature is also there to enjoy. All of this is closer than you might think from Helsinki Airport! The road going around the lake is about 20 km in length. Take a free bike at the Villas, ride around the lake and visit interesting locations! There are a lot of sporty activities to choose from. You can rent SUP boards and play tennis at Hotel Gustavelund (www), play golf or minigolf at Tuusula’s Golf Club (www) or rent a roaring boat to explore the lake! There are also multiple restaurants surrounding Lake Tuusula. The touring is now made very easy thanks to Visit Lake Tuusula Hop-On Hop-Off Bus that takes you from Järvenpää city center to Lake Tuusula just for 5 € a day. Children under the age 16 and Museum Card holders are able to come for free. The bus ride is available from 15th of May to the 31st of August 2018 from Tuesday to Sunday. To Järvenpää you can come by train from Helsinki city center. Lake Tuusula is known for the inspiration many well-known Finnish artists especially in the late 1800s and early 1900s were able to get from the beautiful views and the peaceful nature. Visit these historical places and museums that really take you back in time. All of these sites are quite close to each other so you can just walk or ride a bike from place to another. Artist Pekka Halonen (1865–1933) was specifically interested in painting the Finnish winter views. Poet J. H. Erkko’s (1849–1906) home which is located a few kilometres from Halonen’s home was designed by Pekka Halonen. From Pekka Halonen’s home and atelier we were able to see the city silhouette of Järvenpää on the other side of the lake. Near Halonen's home there's a possibility to rent a boat. The first hour of renting costs only 7,50 €! 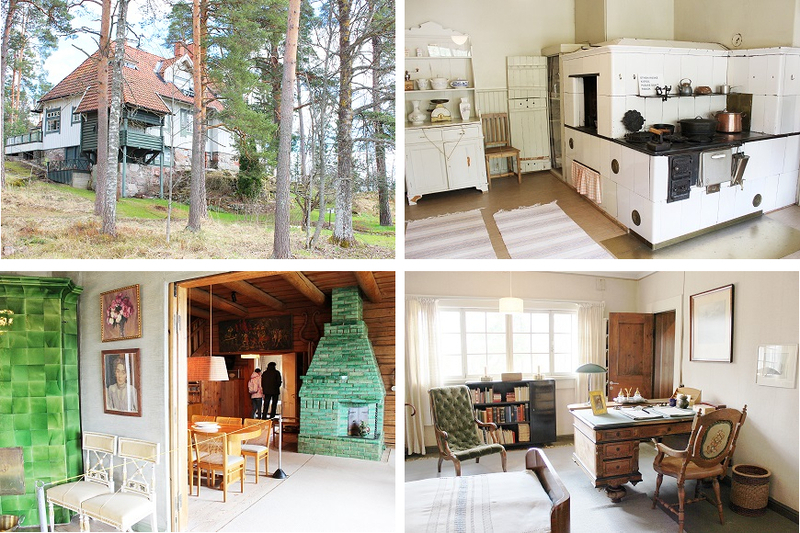 Pekka Halonen’s home and J. H. Erkko’s home are now museums. Juhani Aho (1861–1921) was a Finnish author and journalist. He was known also in Europe and was nominated 12 times for the Nobel prize in literature. We were guided through Aho's home by guides Maria Tukia and Topias Ahola who told us that Aho and his wife, artist Venny Soldan-Brodfeldt, met in Kuopio when she was painting a portrait of a well-known Finnish women's rights activist Minna Canth. It kind of seems like everyone during that time knew each other! At the historic Kallio-Kuninkala area there are multiple buildings and beautiful surrounding Finnish countryside views. In the summer there can also be found a cafe! Pekka Laitinen’s (in photo) said that his mother worked as a cook for artists such as Sibelius who also lived near the lake. As a young boy Laitinen had the opportunity to help Jean Sibelius’ wife Aino Sibelius who lived at home near Lake Tuusula until the day she died. Now the home of the well-known Finnish composer Jean Sibelius (1865–1957) and his family is a museum that is open during the summer months. We explored inside the very unique house and the garden. There is also a modern cafe in the same lot. We noticed that the home of the world-famous composer is a popular tourist attraction already at the beginning of May. There were women called lottas who for their part helped Finnish people to get by during the World War 2. 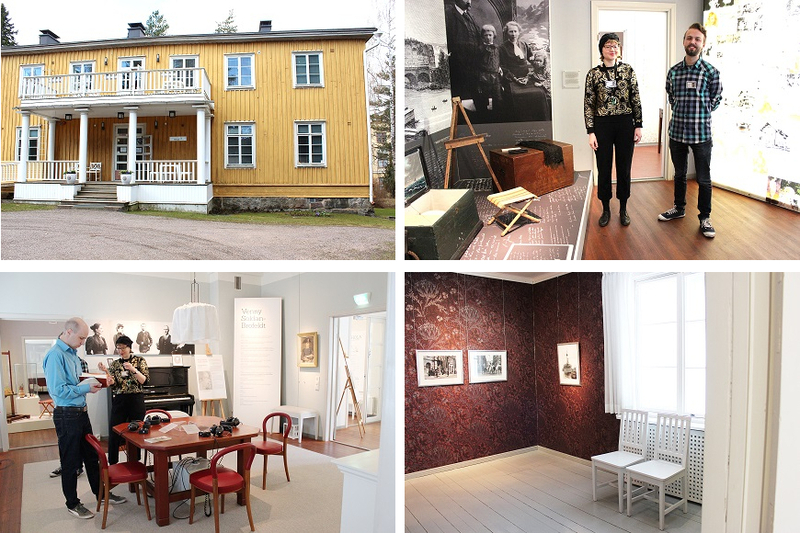 This museum is dedicated for the amazing work these women of all ages did for Finland. There is also lunch served and the views are once again very beautiful to the lake from the massive blue museum building! We visited the exhibition which was full of details. We were guided through the exhibition by the Lotta Museum's guide Pauliina Pajala. It was nice to see that the exhibition texts were available also in English. There are interesting places to visit also on the other side of the lake! We had to go and explore there too. In Pytingin Puoti you can buy all kinds of handmade things made with different techniques. 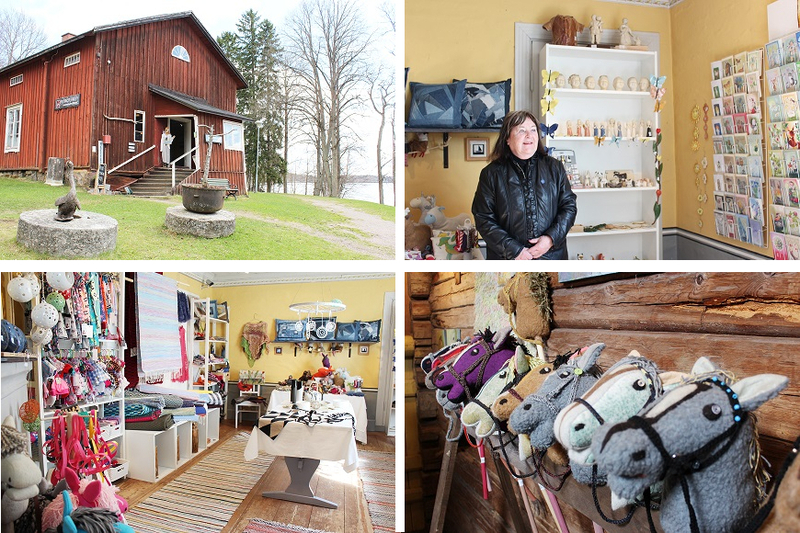 Pirkko Korpela (in photo) who enjoys making crafts herself told us that according to international tourists the prices are surprisingly low! The pink Vanhankylä’s manor can be found next to the handicraft store. Even though the manor is built in the 1800s the re-opened cafe restaurant is only 3 years old this year! Entrepreneur Lauri Ollari (in photo) and his team have made it also possible to come and stay the night in a camping trailer and visit the manor. Enjoy a cup of coffee while looking at the lake and go through your mind all the things you learnt that day about the Finnish cultural history! One of our Star Destinations, Pescator Villas (Villa Kuha, Villa Karppi and Villa Lohi), is located in Tuusula (30 minutes from Helsinki city center, 15-20 minutes from Helsinki Airport). All apartments are spacious (280 m2) and best suitable for groups of 6-11 people (one apartment/group). In an apartment there are 4-5 bedrooms, living room, dining room, 1 entertainment room, 2 bath rooms, hot tub, 2 saunas, 2 terraces, and 1 private balcony. Free Wifi is available. Parking is free. We have chosen Pescator Villas and cultural Lake Tuusula as the Destination of the Month in May 2018. Pescator Villas and VisitTuusulanjärvi are our Star Destinations and media customers.